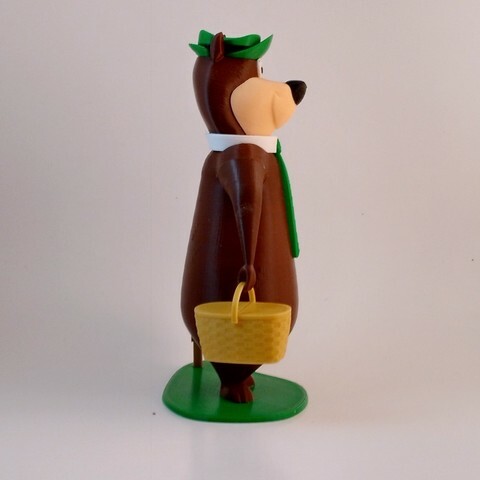 Yogi Bear, from the cartoon series by Hanna-Barbera. 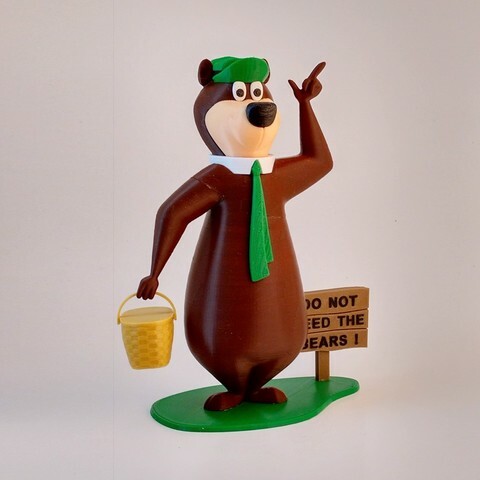 Yogi is from Jellystone Park and his most popular saying is "I'm smarter than the av-er-age bear! ", although he often overestimates his own cleverness. 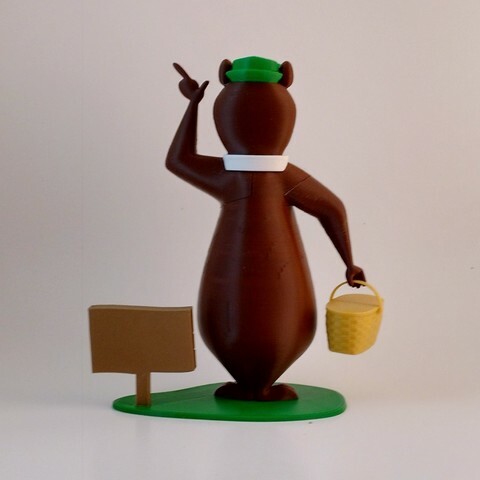 The model is 200mm tall. 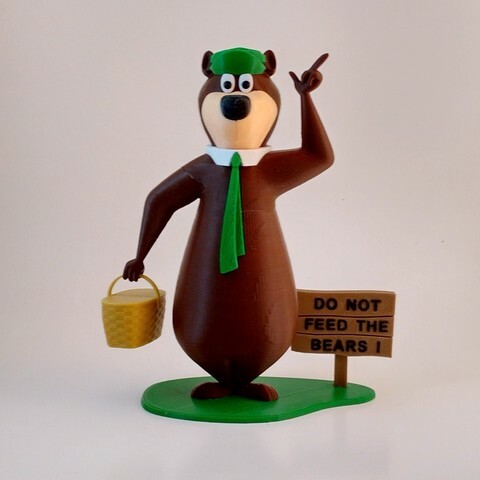 Enjoy, and don't forget to bring along your own "pic-a-nic basket" like Yogi. See below for helpful printing and assembly tips. 3-I did not require any rafts or brims for any of the parts, except for the main body. It's the largest piece and has a small 'footprint' so I used a brim as a precaution. 4-I purposely have the words for the sign positioned to print upside down. I've found that for accuracy, the top layers of a printed part are more consistent in size than the very bottom layer (no matter how well leveled you plate is). This way the flat side from the printer bed becomes the side that you see and the top layers of the letters get pressed into the sign. Simply flip the words stl if you do not agree, and print them normally. 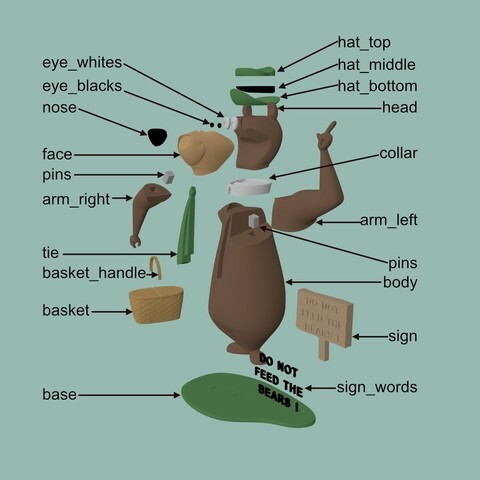 1-There are only two pins required, one for each arm. I originally planned for a pin in the hat but determined that the hat fit better without the pin. Ignore the hole for the pin. 2-The left and right eye_whites are not the same, use the top of each eye_white piece to match the slight curve of the hat. 3-Glue the basket_handle to the basket only. Attach the basket to the hand simply by tilting the basket into the hand. No gluing is required and the basket can swing a bit. 4-Each letter is put into the sign individually as per the above explanation.